A few hours after you've just put your child to sleep, do you find your child wandering around in the house looking dazed and puzzled? Sleep walking, also known as somnambulism which involves getting up and walking around while asleep, is very common in children between the ages 4-8. 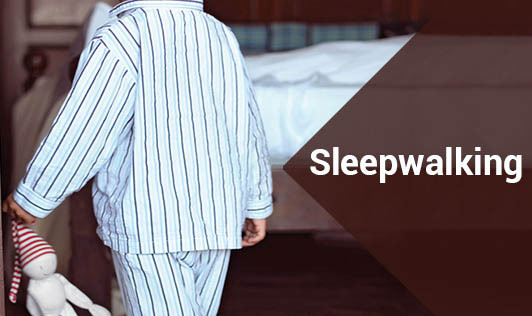 Researchers estimate that 15% of kids sleepwalk regularly and sleepwalking may run in families, sometimes occur when a person is sick or not getting enough sleep and is stressed, has fever, fatigue or is on some medications. Despite its name, sleep walking can range from undamaging (sitting up) to potentially unsafe (wandering outside the house) outcomes. Most sleepwalkers outgrow it by the early teen years. A sleep walker's eyes are usually open but they don't see the same way they do when they're awake. • Don't wake a sleepwalker abruptly because this might scare your child. Instead, guide him or her back to bed. • Make sure that you lock the doors and windows, not just in your child's bedroom but throughout your home. • Don't let your sleepwalker sleep in a bunk bed, this can prevent falls. • Keep sharp and breakable things away from your child's bed. • Unwind at bedtime by making your child listen to some soft music or relaxation tapes. • Follow a regular sleep schedule and stick to it. • Make sure to keep the lights and noise at minimum while you're child is trying to sleep. • Avoid giving liquids before bedtime because a full bladder can contribute to sleepwalking. So, the next time you find your child sleepwalking, don't fret! Gently, steer your child back to the safety and comfort of his or her bed.